Statisticians and philosophers of science have many common interests but restricted communication with each other. This volume aims to remedy these shortcomings. 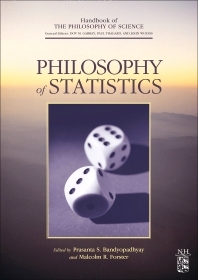 It provides state-of-the-art research in the area of philosophy of statistics by encouraging numerous experts to communicate with one another without feeling “restricted” by their disciplines or thinking “piecemeal” in their treatment of issues. A second goal of this book is to present work in the field without bias toward any particular statistical paradigm. Broadly speaking, the essays in this Handbook are concerned with problems of induction, statistics and probability. For centuries, foundational problems like induction have been among philosophers’ favorite topics; recently, however, non-philosophers have increasingly taken a keen interest in these issues. This volume accordingly contains papers by both philosophers and non-philosophers, including scholars from nine academic disciplines.